This great turkey panini recipe layers melted cheese, sun-dried tomatoes, roasted peppers and turkey with creamy Hellmann's® or Best Foods® Real Mayonnaise. 1 Spread rolls with Hellmann's® or Best Foods® Real Mayonnaise. 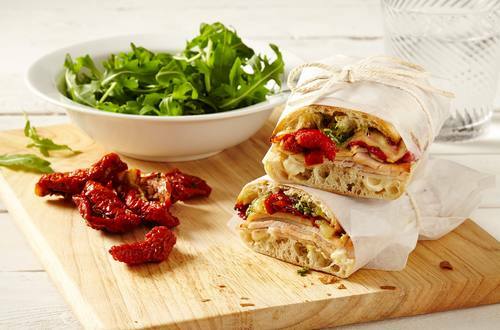 Top with turkey, sun-dried tomatoes, roasted peppers, cheese and pesto. 2 Toast sandwiches in sandwich press or cook in large nonstick skillet until golden and cheese starts to melt. *Variation:  Use your favorite sliced bread.